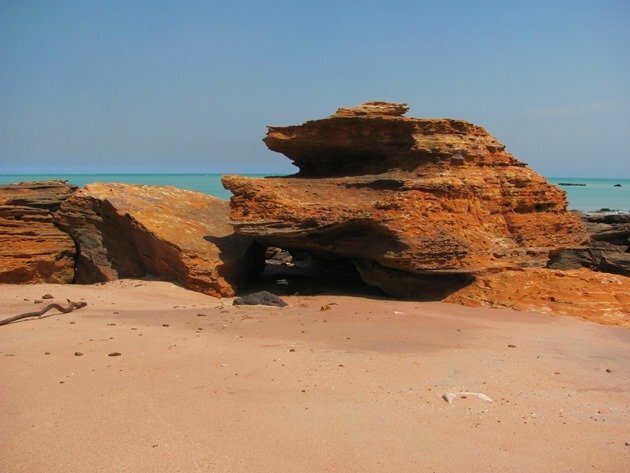 During our cooler months, which have really come to an end, we can observe huge flocks of Brown Boobies diving into the ocean close to Broome. During the rest of the year there are less of them, but they are usually present and seen further out to sea. They breed on offshore islands off the Western Australian coast and on the Great Barrier Reef in Queensland. They feed on small fish and recent research is showing that the smaller male bird suffers more than the female during chick rearing. 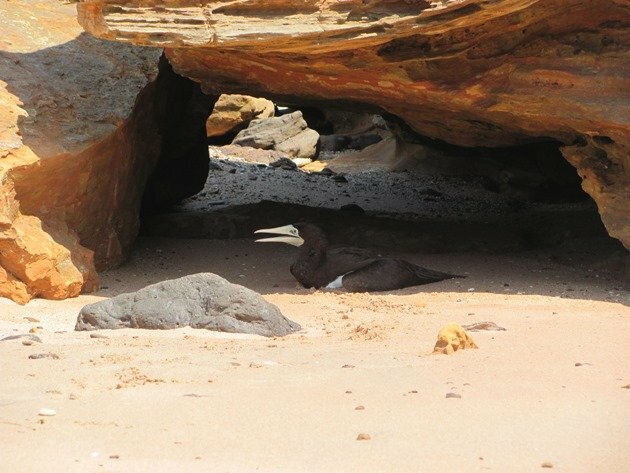 The Brown Boobies along Broome’s coastline will dive continuously until they have consumed enough food and then rest on the ocean surface. It is not uncommon to see quite large flotillas of these birds when the food supply is good. On a trip to the beach this week by bicycle I discovered a lone Brown Booby that had been left behind at high tide in the middle of the night. It had been in the direct sun for over 4 hours when I arrived there and the temperature was already 39c/102f and extremely dry. 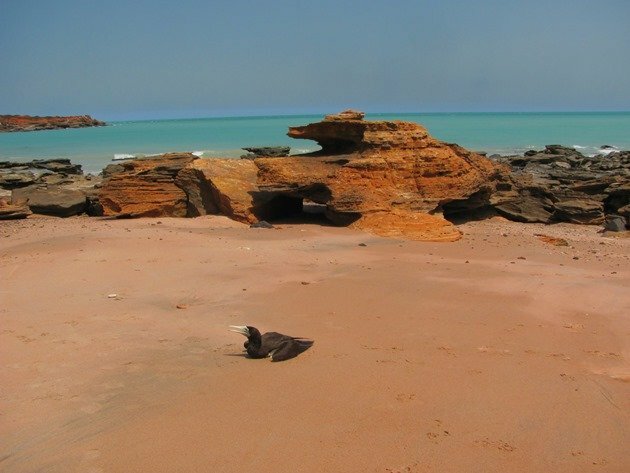 We do not have a seabird rescue service in Broome and the kindest thing I could think of was to approach it and see if it could be moved into the shade. When I approached it I discovered that it had actually waddled some distance towards the ocean. There were feint prints in the sand where it had recently moved and how now given up. It was however rather feisty when I got really close and it has a rather large bill with serrated edges. I returned to the high tide line to look for something to aid me to move this large bird into the shade and found a long tree branch. 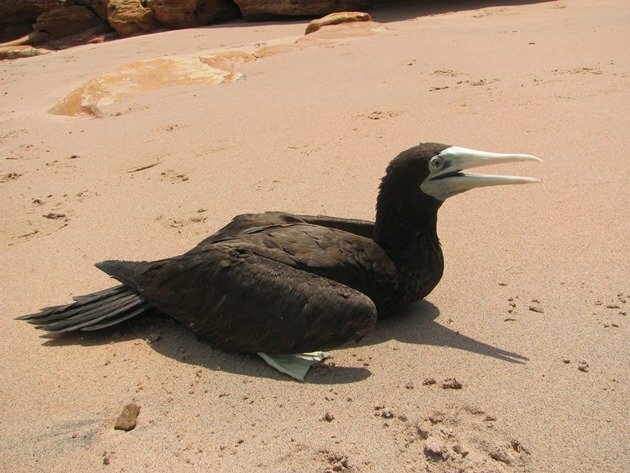 I was then able to move the Brown Booby into the shade close by and it would hopefully gain strength before the high tide in a few hours’ time. I sat in the area for some time watching other shorebirds and then the Brown Booby had definitely gained strength and I was fairly confident that the bird would return to the sea once the tide reached it. 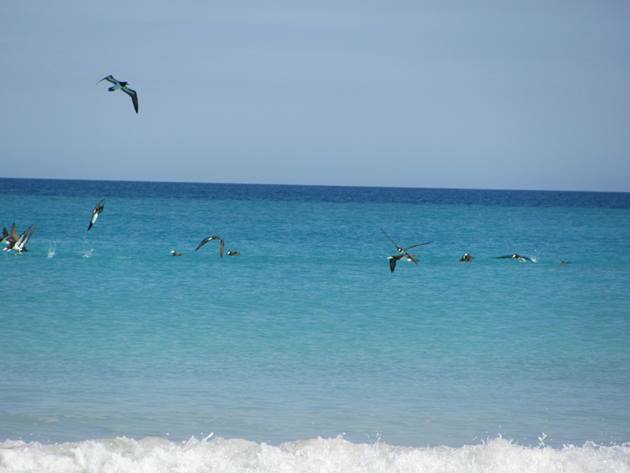 I returned to the area the following day and there was no sign of the bird, so I hope it did return to the ocean to feed. 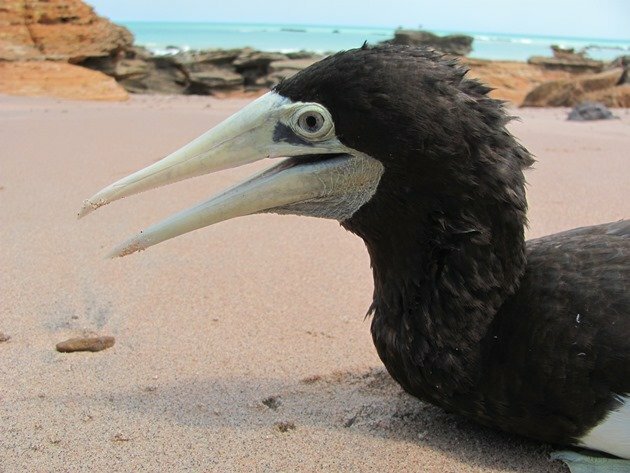 There are very few other Brown Boobies around at the moment close in to shore and it may have misjudged the depth of the water when diving or just been old. I have had to word this rather carefully because last month the Christmas Island tourism board upset Facebook with their innocent promotion of “juvenile Boobies”! Aww, you did a kind thing there, Clare, for a suffering bird. I hope the little (er, big) fellow made it back to sea OK. Kudos to you for looking out for it! Thanks, Meredith….I hope it was OK too. Such a beautiful bird. I hope it survived.